The dental industry requires custom-part, single-unit production, with excellent accuracy. Therefore, dentistry is getting more and more attention in the 3D printing industry. Additive manufacturing equipment manufacturers and material suppliers for these printers are already taking notice. Currently, 3D printing is used to provide a number of products in the dental industry. Most common are wax patterns for fixed prosthodontics and models fabricated from intraoral or impression scans. However, popularity is gaining for orthodontics and removable prosthodontics. There are basically 5 different 3D printing technologies being used in the dental industry today: Digital Light Projection (DLP), Jet, Stereo-Lithography Apparatus (SLA),Selective Laser Sintering and Direct Laser Metal Sintering (DLMS). The variety of each technology is in the materials used, how those materials are solidified, and how they can be used. The working material for Digital Light Projection is UV- and a visible-light sensitive material (resin) held in a reservoir. A wiper blade spreads material uniformly across the build platform after each layer is printed. DLP then takes advantage of the same technology used in certain television sets and presentation projectors to illuminate the outline of all of the parts simultaneously. The printed material is cured using a lamp or LED light source depending on printer model. Typical vertical resolution is 13 µm to 50 µm with very good accuracy and excellent surface finish. Post-print processing involves removal of support material by rinsing. 3D jet printing is just what it sounds like, a more sophisticated big brother of the inkjet printer. Instead of ink being jetted or sprayed onto paper in a single layer, a resin or wax is jetted onto support material, and then onto previously sprayed layers until the part begins to take on depth and shape. 3D Jet printers may have a single print head like a computer printer, or they may have multiple heads to cover the width of the working platform. Either the print head moves across the working platform, or the platform moves back and forth under stationary print head(s). The 3D Systems and Stratasys (formally Objet) printers use a UV lamp or a light source to harden the resin or wax after each layer is jetted. The Solidscape printer jets a heated wax that cold-cures in place and does not require exposure to a UV light source. Typical layer thickness ranges from 16 µm to 50 µm with excellent accuracy and surface finish. Post-printing processing is simply removal of the support material, usually with a water or oil bath and simple rinsing. Most systems have self-cleaning print heads, so no user intervention is required. The curing light source, if necessary, is usually a Xenon lamp with a long service life. An example is the The ProJet™ CPX 3000 3D Production System. It uses proprietary Multi-Jet Modeling (MJM) technology combined with new VisiJet® CPX200 wax build Material and new VisiJet® S200 dissolvable wax support Material to produce reportedly 100% RealWax™ patterns that are designed to perform like injected wax patterns in lost-wax casting processes. Stereo Lithography Apparatus (SLA) 3D printing uses a UV-sensitive liquid resin as the working material. A UV-laser is projected on and moves across the reservoir of the resin build material, illuminating and hardening the liquid resin only in the areas where the part is being printed. If multiple parts are being printed, each part is traced on the resin by the laser. The platform holding the part or parts lowers after each layer is printed, and a wiper blade spreads more build material uniformly across the working space. The UV laser makes another pass, tracing the outline of the next layer for each part in the print job. The process is repeated layer by layer until the job is complete. SLA technology allows for varying the layer thickness throughout the printing process. Some layers can be 100 µm thick where accuracy is not critical and then dialed to 50 µm or less when greater accuracy is required. SLA printing technology is available with a wide variety of materials. A 25-µm to 50-µm layer thickness is achievable with excellent accuracy and good surface finish. SLA typically has slower build times due to the laser outline of each part. Post-print processing may require cutting the final part from the support material, removal of excess material, and the parts placed in a UV oven for final curing. Selective laser sintering (SLS) is an additive manufacturing technique that uses a high power laser (for example, a carbon dioxide laser) to fuse small particles of plastic, metal (direct metal laser sintering), ceramic, or glass powders into a mass that has a desired 3-dimensional shape. 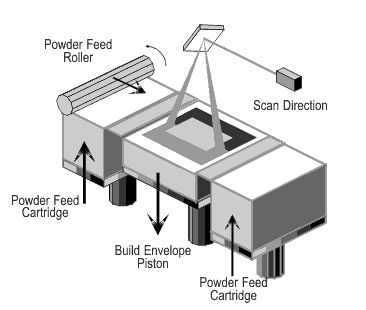 The laser selectively fuses powdered material by scanning cross-sections generated from a 3-D digital description of the part (for example from a CAD file or scan data) on the surface of a powder bed. After each cross-section is scanned, the powder bed is lowered by one layer thickness, a new layer of material is applied on top, and the process is repeated until the part is completed. DLMS uses a metal powder and SLS typically uses a plastic powder. The powder is spread across the working platform. A laser traces the outline of each part being printed, fusing (DLMS) or melting (SLS) the powder to the layer below it. The platform is lowered, a new layer of material is spread across the platform and the process repeated until the print job is complete. DLMS technology has traditionally only been available for printing non-precious metals. Recently, Argen has developed its own materials and techniques for the EOS machine that allows them to provide both non-precious and noble metal copings. Post-print processing requires cutting off the support material. Additive manufacturing technology in the dental industry is gaining popularity. Materials and printing techniques continue to improve as manufacturers receive feedback on what is needed in terms of performance. Available materials are often manufacturer- and, sometimes, machine-specific. Be sure to check with the manufacturer on available materials for any printer under consideration for purchase. Most manufacturers are more than willing to send sample parts if they are sent an STL file to work with. It is a great way to assess the accuracy, finish, and workability of the material produced from the printer. 3D printing technology has been used for years for rapid prototyping (RP). Equipment manufacturers often want to create a prototype part without investing in expensive tooling. Typical use for RP technology has been same-part, small-volume production, with very good to excellent accuracy. The dental industry requires custom-part, single-unit production, with excellent accuracy. The volume of single-unit production in the dental industry is unlike anything the RP industry has encountered before. Dentistry is quite possibly the ultimate industry for RP technology to move into. Additive manufacturing equipment makers and material suppliers for these printers are already taking notice. When looking for examples of current applications of 3D printing, you’ll find that Stratasys is a real market leader due to their high resolution printers, the Objet Connex and the Objet Eden series. Because these series can promise such high resolutions (down to 6 µm), it is the only real candidate for a precision industry such as digital dentistry. What makes 3D printing interesting for dental lab owners is that the labs are are able to save time and labor, while at the same time improve the quality and precision of dental parts they manufacture. For a growing number of dental lab owners, digital dentistry is a fact. They have incorporated CAD/CAM automation into their strategic business models. ClearCorrect (based in Houston Texas) manufactures clear aligners and serves over 11,000 orthodontic clients. The Objet 3D Printers can rapidly produce whole trays of individually-customized digital stone models which serve as extremely accurate base-mold tools upon which the clear aligners are then thermoformed. Apex Dental Milling use the Objet Eden260V 3D printer to turn digital impressions into solid dental models for dental and orthodontic clients. AB Dental, a global provider of dental surgical guides, describes how their in-house Objet 3D printer allows them to digitally produce surgical guides for the mouth. The use of 3D printers enables AB Dental to rapidly produce highly accurate, customized surgical guides in see-through bio-compatible material and without the need for slow manual work. Clearstep is a UK based orthodontics lab using Objet 3D printers to rapidly produce customized teeth models for the production of clear aligners and clear positioners. The move for digital orthodontic workflow with the use of Objet 3D printers has enabled the company to achieve consistent accuracy, consistency and speed for their customers. Can an SLS printer be used for dental applications? As in are there safe materials that can work with the SLS technology?